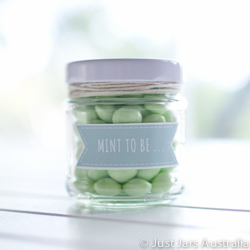 Here at Just Jars Australia we sell glass jars and bottles in a whole range of sizes, including genuine Ball Mason jars. All of our jars are food grade glass, and can be supplied with lids in a range of colours, or without. Whether you’re looking for wedding jars, candy jars, baby shower bombonniere / bonbonniere jars, homebrew beer bottles, or just fancy preserving some home-made jam or chutney, we’d love to help you out! Our mixed packs of glass jars in assorted sizes make ideal rustic chic wedding decor, filled with flowers or candles and arranged in clusters on tables, whilst our little jars with lids are just perfect for DIY wedding favours or corporate gifts. We also retail long neck beer bottles just right for home brew, authentic Ball Mason branded jars, a select range of Australian-made ceramics and chunky, ready-to-paint freestanding wooden table numbers. We’re always happy to put together custom orders on request, and we pack all of our jars carefully, with respect to the environment, using recycled/reused packing materials wherever possible. 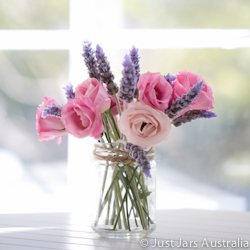 Although we’re located in Sydney, we’ve posted our glass jars and bottles all over Australia, including Sydney, Canberra, Melbourne, Adelaide, Darwin, Brisbane, Gold Coast, Perth, Launceston, Geelong, Hobart, just to name a few. Ready to shop? Start here, where you’ll find our full range summarised on a single page.